The following remarks were offered by the Rev. Erik Christensen on behalf of the Logan Square Ecumenical Alliance (LSEA) on the occassion of being awarded the “Community of the Cross” award by the faculty of the Lutheran School of Theology at Chicago (LSTC) at their commencement ceremony on Sunday, May 21, 2017. It is an honor to receive this award, particularly on a day when we are celebrating the commencement of a next chapter in the ministries that will be led by those graduating today — ministries of Word and Sacrament, Word and Service; ministries of scholarship and education, of justice and advocacy; baptismal vocations, all, and all needed in our world, which is so terribly wounded and divided. 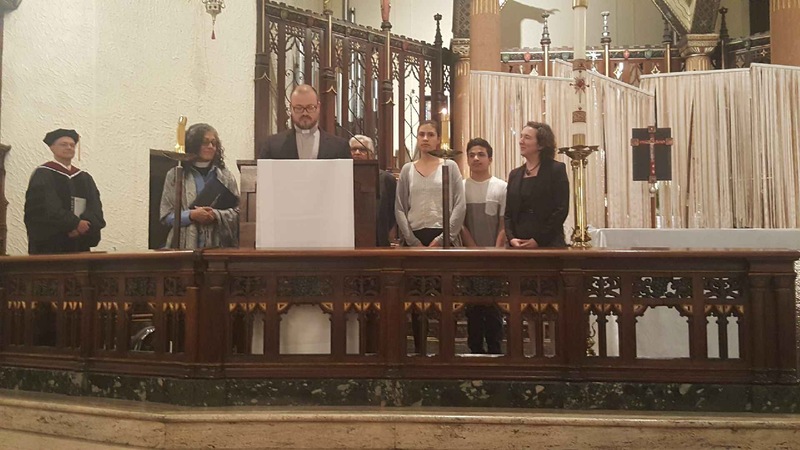 I would like to share just a few words about how the Logan Square Ecumenical Alliance came into being, in the hope that this story might somehow serve today’s graduates. Like many Chicago neighborhoods, Logan Square is a community divided along deeply entrenched lines. It is divided by race and class, by income and ethnicity. It is divided between those who have lived there for generations and whose families are being pushed out, and those who have recently arrived and are trying to make a new home for themselves. It is divided by language and immigration status, and by the prejudices and presumptions people make about one another on the basis of their skin tones and names and accents. Sadly, it is also divided by religious identity, and nowhere is that division seen more clearly than in the great chasms between the various congregations who all name themselves Christians. 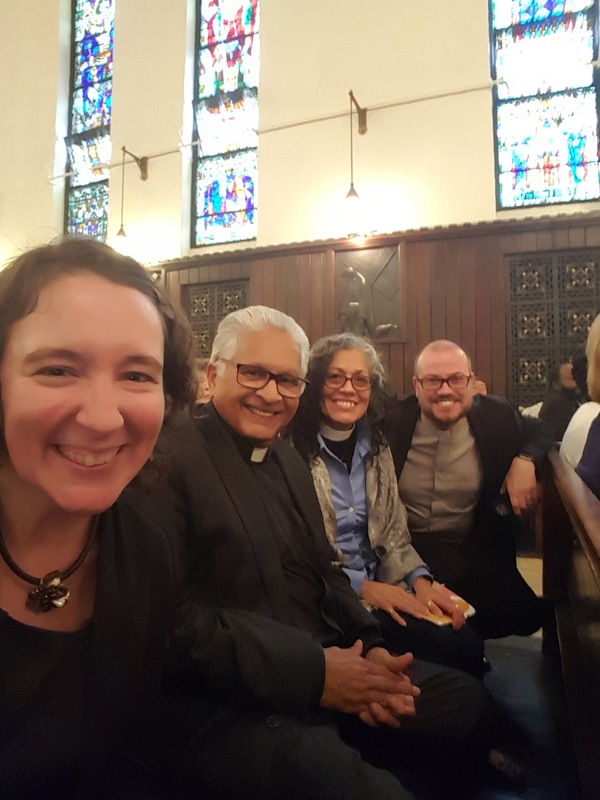 When the Logan Square Ecumenical Alliance was being formed just over seven years ago, it was not because our congregations had a desire to worship together. In fact, I think we all suspect that if the initial invitation had been to come together for worship, we might never have gathered at all. Of all the things that divide the body of Christ (and, for that matter, the ELCA), our habit of mistaking comfort for culture and preference for praxis has got to be one of the most embarrassing. So worship, which we might assume — or at least hope — would serve as the starting point for our ecumenical witness, is often times in reality its greatest barrier. Instead, what drew us together was our commonly held vision for the neighborhood we shared, for the people of our separate congregations who were living side-by-side, and our conviction that faith in Jesus Christ calls us to leave our sanctuaries and join the struggles taking place in our streets — not as a demonstration of self-righteousness, but as an act of solidarity, an acknowledgement of our shared humanity, and an outpouring of love which (to quote the Rev. Dr. Cornel West) when made public, looks like justice. So, over the years, whether our work has been directed toward the scandal of the $480 million dollars of federal housing funds the city of Chicago is sitting on as it flips public housing land into market rate developments; or the loopholes in Chicago’s Welcoming City ordinance that allow the police to co-operate with Immigrations and Customs Enforcement in detaining and deporting members of our communities; or calling for a new police contract that makes it possible for us to hold the Chicago Police Department accountable for its deeds and misdeeds as we labor for civilian oversight over those charged with protecting and serving Black and Brown lives to the same standard and with the same care White people take for granted; this work is rooted in love — love for one another made possible by the love we have first known from God through Christ Jesus. And here’s the thing that gives me such hope. As we have done this work together, it has been our experience that the lesser issues of comfort and preference have largely resolved themselves, and the more important issues of culture and praxis have become for us opportunities to know each other in new and important ways, so that now we are glad to worship together and, in fact we look forward to it, because we have gotten a foretaste of the feast to come and we therefore cannot wait to join each other at the banquet. May the ministries inaugurated on this day prove as great a blessing to each of you as our joint ministry has been to each of us. May you find common cause with the people of those other dwelling places where God’s people gather. May your labor for justice come from the place of love. We’ll be watching for you at the banquet.